In Isaiah 40:25-26, God asks the rhetorical question concerning who is like him and his equal, he then sets himself apart by describing the creation he made. God alone is the creator. To whom then will ye liken me, or shall I be equal? saith the Holy One. Lift up your eyes on high, and behold who hath created these things , that bringeth out their host by number: he calleth them all by names by the greatness of his might, for that he is strong in power; not one faileth. Hebrews 3:4 tells us that the one who built ALL THINGS is God. So the creator is God. he that built ALL THINGS is God. Isaiah 44:24 once again establishes that the LORD is the creator of ALL THINGS and it was accomplished by him alone. 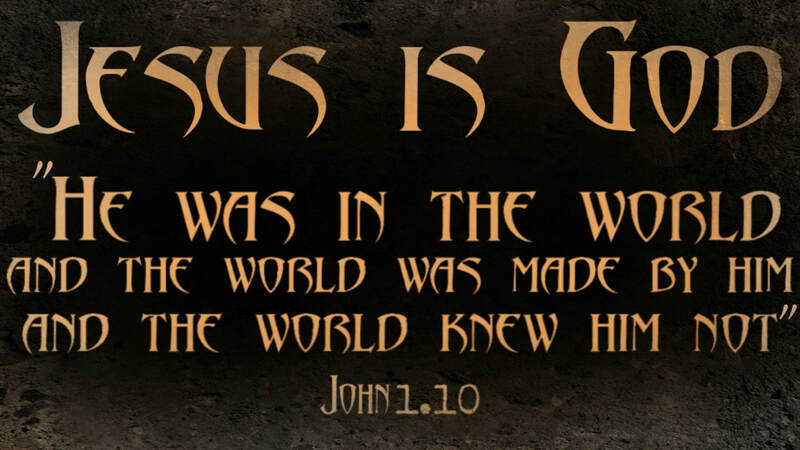 ​John 1:3, speaking of the Word who became flesh (Jesus Christ), says that ALL THINGS were made by him. Although that would be enough to establish Jesus is God the creator according to the old testament, the point is further reiterated as the scripture goes on to say that "without him was not any thing made that was made." In other words, anything that came into existence was brought into existence by Jesus Christ, everything in the made category, he made it. This verse alone refutes anyone who would deny Jesus is God and teach he is a creature. Again, Colossians 1:16-17 attributes to Jesus what belongs to God alone, that being Jesus created ALL THINGS. Not only that, but notice how the inspired author Paul stresses the point? He doesn't simply say Jesus created all things, no he begins to describe the entire creation, why did he do that? Not only that he repeats Jesus created all things for himself after. As with John 1.3, Colossians 1.16-17 accentuate the point of Jesus being the creator of all creation. ​FOR BY HIM WERE ALL THINGS CREATED, that are in heaven, and that are in earth, visible and invisible, whether they be thrones, or dominions, or principalities, or powers: ALL THINGS were created by him, and for him:  And he is before ALL THINGS, and by him ALL THINGS consist. It is written in Proverbs 16:4 that the LORD made all things for himself. But who made all things for himself in Colossians 1.17? The Lord Jesus Christ. Revelation 14:7 and Jeremiah 10.11 work together well against the heretics known as "Jehovah's witnesses" who deny Jesus is God and teach he is "a god" by whom all other things were created through. With these verses together they must either worship Jesus as the creator or believe he will perish along with the false gods. According to Jeremiah 10.10, the true God is the LORD who is the living God. If we compare this scripture with Acts 14.15, it says the living God (who is the True God) made all things. Who made all things according to John 1.3 and Colossians 1.16-17? Jesus Christ. Jesus Christ is the true living God. God says in Isaiah 45:12 that he made the earth and John 1.10 tells us that the one who made the world was in it. So when was God in the world? He we as in the world, and the world was made by him, and the world knew him not. Psalm 102:24-27 is an old testament passage where David offered a prayer to God. This very passage is quoted and applied to the Lord Jesus in Hebrews 1.10-12 after the Father calls him God. These two scriptures once again are very useful in refuting the antichrist doctrine of "Jehovah's Witnesses". Why? Because in their so called Bible they will only translate the Greek word Kurios to Jehovah when they believe it is in reference to the Father. So when Christ is called Kurios they will translate it simply as "Lord"; based on this you can use their own so called Bible against them because in Hebrews 1.10 they do not translate Kurios as Jehovah so they affirm the scripture is describing Christ. However this passage of scripture is quoting is a scripture about God. 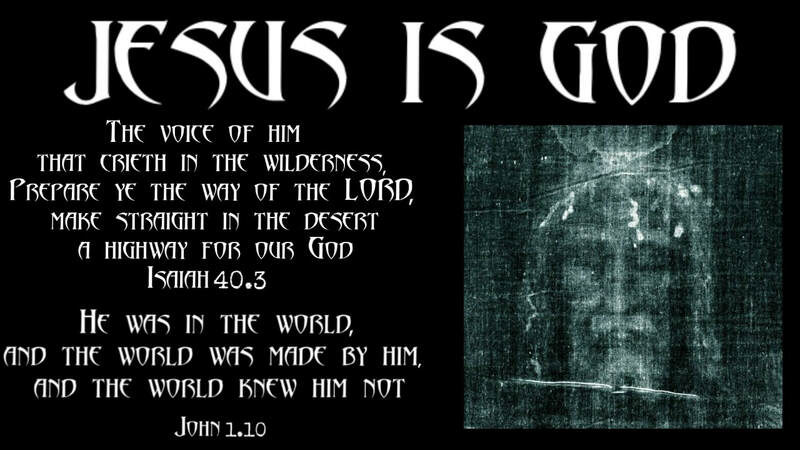 Jesus is God. The creation is the work of the hands of Jesus. I said, O my God, take me not away in the midst of my days: thy years are throughout all generations. Of old hast thou laid the foundation of the earth: and the heavens are the work of thy hands. They shall perish, but thou shalt endure: yea, all of them shall wax old like a garment; as a vesture shalt thou change them, and they shall be changed:  But thou art the same, and thy years shall have no end. But unto the Son he saith, Thy throne, O God, is for ever and ever: a sceptre of righteousness is the sceptre of thy kingdom.Thou hast loved righteousness, and hated iniquity; therefore God, even thy God, hath anointed thee with the oil of gladness above thy fellows. And, Thou, Lord, in the beginning hast laid the foundation of the earth; and the heavens are the works of thine hands: They shall perish; but thou remainest; and they all shall wax old as doth a garment; And as a vesture shalt thou fold them up, and they shall be changed: but thou art the same, and thy years shall not fail. For thou, the , hast made me glad through thy work: I will triumph in the works of thy hands. Psalm 95:5-6 demonstrates as with Revelation 14.7 that the creator (the Lord Jesus) is to be worshipped. The sea is his, and he made it: and his hands formed the dry land . O come, let us worship and bow down: let us kneel before the Lord our maker. For all those things hath mine hand made, and all those things have been, saith the LORD : but to this man will I look, even to him that is poor and of a contrite spirit, and trembleth at my word. Ye are my witnesses, saith the LORD , and my servant whom I have chosen: that ye may know and believe me, and understand that I am he: before me there was no God formed, neither shall there be after me. I, even I, am the LORD ; and beside me there is no saviour. I have declared, and have saved, and I have shewed, when there was no strange god among you: therefore ye are my witnesses, saith the LORD , that I am God. Yea, before the day was I am he; and there is none that can deliver out of my hand: I will work, and who shall let it? And I give unto them eternal life; and they shall never perish, neither shall any man pluck them out of my hand. My Father, which gave them me, is greater than all; and no man is able to pluck them out of my Father's hand. I and my Father are one. Then the Jews took up stones again to stone him. Jesus answered them, Many good works have I shewed you from my Father; for which of those works do ye stone me? The Jews answered him, saying, For a good work we stone thee not; but for blasphemy; and because that thou, being a man, makest thyself God.